The fearless Gurkhas rousing phrase executed in a typical Gurkhali style..
Another front liner of the celebrated “Patriotic Series” category of KHHI released to honor one of the most fearsome and respected soldiers the modern world has ever seen; the GURKHAS. “Aayo Gurkhali” in native Nepalese means “Here come the Gurkhas”, the famous war cry of the Gurkhas. The legend says it all, the fearless Gurkhas used to charge upon their enemies screaming this rousing phrase in a typical Gurkhali style. It is believed to have been the enemies’ worst nightmare and comrades/battalion best possession/armor at the same time. The Aayo Gurkhali kukri is put on KHHI’s shelf to honor all Gurkhas who were and are in the front line risking their lives to protect freedom and humanity. Khukuri House Handicraft Industry proudly presents this khukuri to show its deep respect and gratitude to all those brave soldiers who gave their lives and willing to give their lives for a noble cause and a better tomorrow. 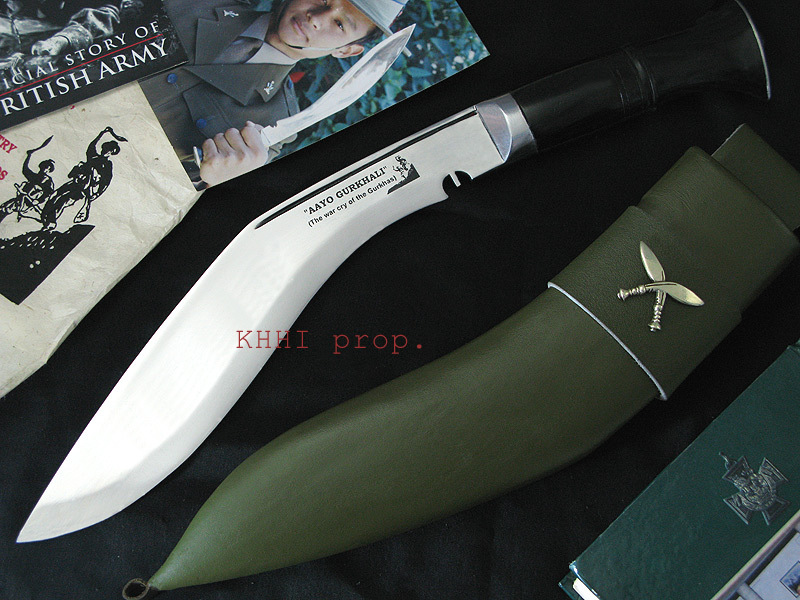 This kukri is basically made in the “World War” version issued to the Gurkhas in world war days however with an improvised finishing. The documented source and collections say that the World War version was widely used by Gurkhas towards the end of World War period. 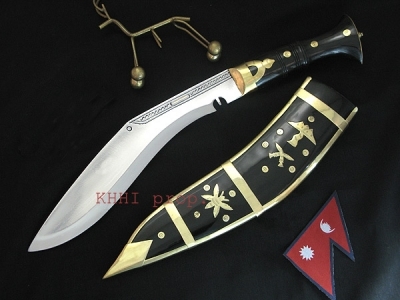 This khukuri is fairly curved thus effective hence favorite of many. The knife is slightly larger and more curved than the current kukri issued to Gurkhas. Steel pommel and but cap are fitted in a regular horn handle to give an over all dashing look. The scabbard of this knife is made in army green colored leather to give a different look and also to camouflage the Kukri with the uniform and gears of the soldiers. The beautiful green scabbard of the Kukri brings more durability and can be a displayable item at the same time. A cross kukri insignia of the legendary Gurkhas is also mounted on frog of the khukuri, done to further give a typical “Gurkhali” look. 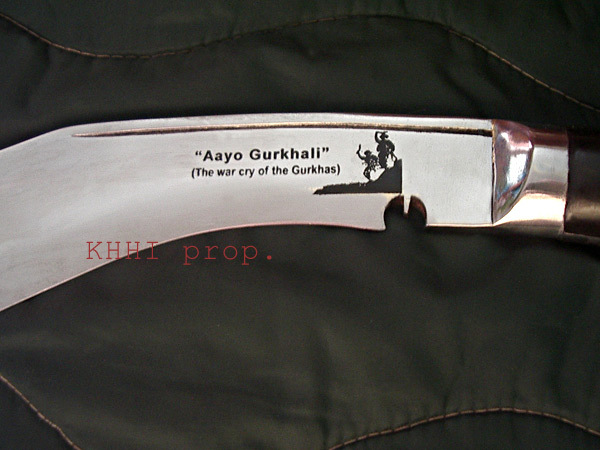 The blade is engraved with the phrase, “Aayo Gurkhali” and the famous “War Cry” insignia (logo) of the Gurkhas as a dedication to the brave soldiers and also to recall their famous war action. Just received my "war-cry" kukri today and wanted to say a quick thanks to all the KHHI team. Vey happy with the product, the sheath is really nice and the knife is very impressive. Great job and i will be ordering from you again.